Learn the history and modern day use of Tibetan singing bowls as a holistic healing practice. Join certified sound therapist Deb Yoder for an evening of discussion and demonstration. 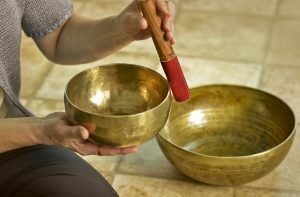 Singing bowls produce sounds which invoke a deep state of relaxation which naturally assists you in entering into meditation with the ultimate goal being enlightenment. Experience the sounds of the singing bowls creating stress reduction, holistic healing, chakra balancing, and left/right brain synchronization. Let the rich blend of harmonic overtones relax and rejuvenate you! This class will also be repeated on November 15. Register through the link for Community Ed.